African violets are a beautiful plant. Their flowers are delicate and too often elusive. Pamper your plant with the proper care to ensure you have blooms. Fertilize the plant regularly to help it burst into bloom and provide you with endless flowers. Help your African violet to bloom by fertilizing it regularly. Garden stores sell specific fertilizers for this plant or you may choose to use a general fertilizer. Follow the directions carefully and fertilize the plant on a set schedule. Give your African violet enough light. Do not put it in direct light, as this may burn the leaves. Place the plant in indirect sunlight and move it to a darker spot if the leaves start to wilt or burn. This plant also thrives under a grow light. African violets thrive in a windows with Eastern exposure. Trim off dead flowers and leaves to ensure the plant has enough energy to bloom. Pamper the plant with regular care and it will reward you with beautiful flowers, even during the winter. When the plant outgrows its pot, get a larger pot. Keep an eye on the health of the plant and browse the African violet section of the garden store to spot new products that may help keep the plant in optimum health. 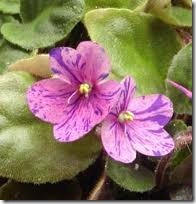 Water the African violet in the morning so the soil has time to absorb the water during the hours of sunlight. Avoid watering in the evening; a soggy plant overnight may lead to leaves that rot. Ensure the plant has sun that is not too harsh. Do not overwater. Soggy soil leads to rotting leaves.